"I was bawling ... The depression literally ended once they saw each other." 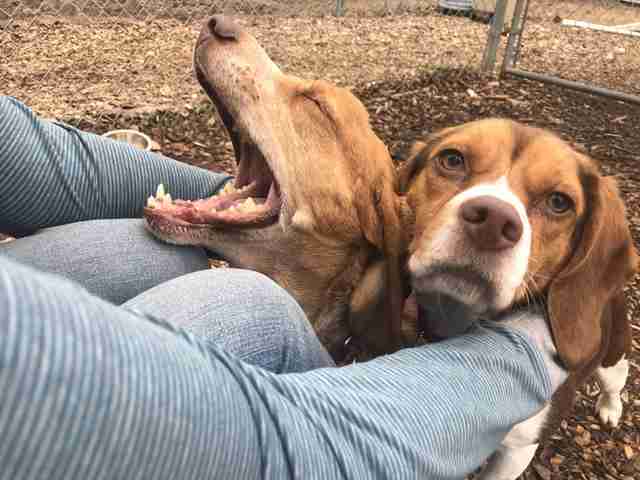 These two beagles were only separated for a few days — but it obviously felt like an eternity to them. 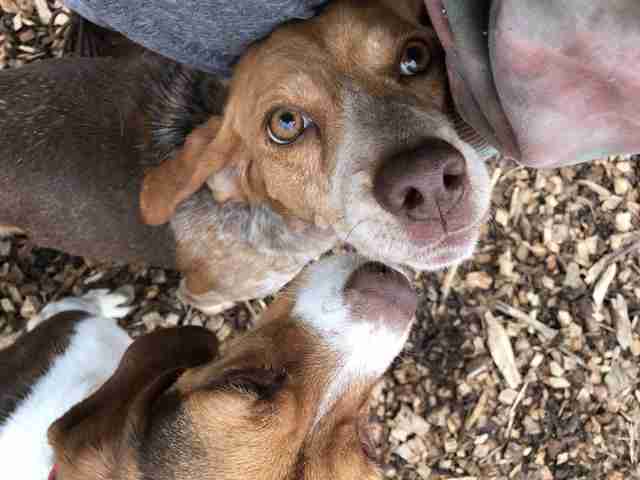 Penny, the mother beagle, and Sarah, her daughter, couldn't contain themselves when they saw each other again. It's understandable, too: Their lives have been turned upside down in recent weeks. When an elderly man in New Jersey passed away, a little family of beagles was left without a home. 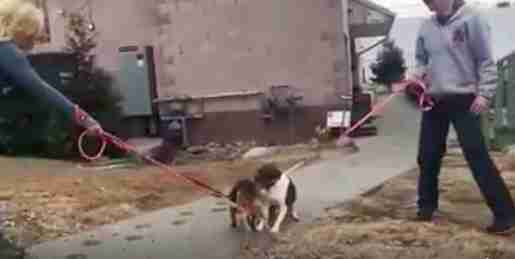 The four dogs had been living in a pen in the man's yard and, according to rescuers, it seemed they were never allowed in the house. But the dogs were very much bonded with each other. But the man's family didn't want to take the dogs in. 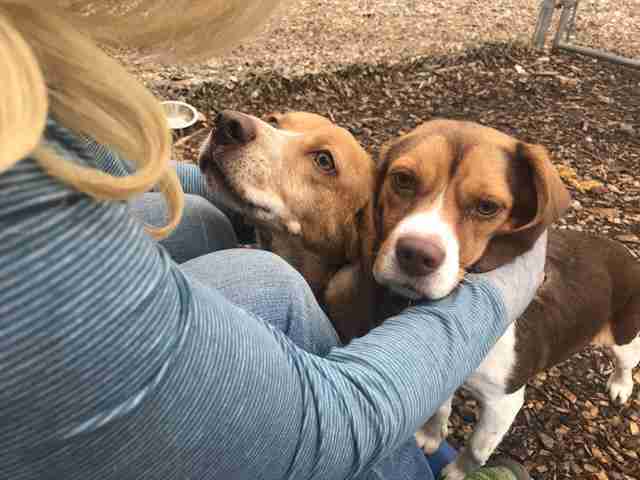 When animal control came they only found two dogs left in the pen — Penny and Buster — and assumed the family had given the other dogs, their puppies, away. Penny and Buster were bonded, but Buster had health problems that needed to be taken care of. 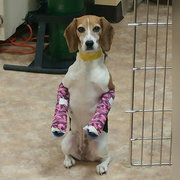 He was sent to an animal hospital for treatment. And Penny went to Ramapo-Bergen Animal Refuge (RBARI). But Penny seemed incredibly down. "Penny was super lonely in the shelter without Buster," Frannie D'Annunzio, spokesperson for RBARI, told The Dodo. "She was put with other dogs, but she was just so sad." As it turned out, though, Penny's kids hadn't been given away — they'd gotten scared and managed to escape the pen before animal control arrived. Just as a possible adopter was being arranged to take Penny, her daughter Sarah was captured and brought to the shelter. The dogs were so happy to see each other. But then Penny went to the potential adopter's home for a trial period. After just two days, Penny ran away. "This broke my heart," D'Annunzio said. That's when RBARI called on a woman famous for her dog-catching skills, Nicole Asher, founder of Buddha Dog Rescue & Recovery (BDRR). Asher set up a feeding station in the woods for Penny where she would return and eventually get trapped, but Penny's rescue would prove to be very tricky. That's because Penny was considered a "flight risk"; she was so skittish it was hard to come close to her without scaring her away. "Penny's capture was difficult due to lack of sightings," Asher wrote. "She was traveling the woods of the Painted Forest and her coloring blended in perfectly with the leaves and landscape ... I had her at my trap only to have her spooked off by a well-meaning person driving by slowly while out looking for her." Asher had to keep starting over, locating Penny, setting up a feeding station, and then setting up a trap. "The woods were vast and it was like throwing a dart at the map trying to pick a spot to set up another feeding station," Asher said. "We watched Penny go in and out of her trap," D'Annunzio added. "She was so smart. She didn’t want to be caught." Meanwhile, Sarah was waiting back at the shelter, totally confused about where her mom went. "Sarah was completely devastated and depressed because she was alone," D'Annunzio said. Even though Sarah had a family interested in adopting her, the people at the shelter realized they couldn't let Sarah go; she would never see her mom again. "When Penny was still missing, I said to our executive director, 'When we get Penny back, they should be together.'" And finally Asher's work in the woods paid off. "I stopped and knocked on the door of the most lovely, gracious woman named Betty whose property backed up to the wooded area where I felt Penny may be crossing," she said. "Within an hour of the feeding station going up, my camera started going off and, lo and behold, Penny was there chowing down. Once she left, I went back and quickly set a trap." ​At 8 p.m., Penny revisited the trap just to mark her territory, to let other animals know that the food there was totally hers. "Seeing this, I knew she'd definitely be back. Four hours later, she was back for a midnight snack and this time went all the way in!" Asher said. "She's a smart, funny girl and being able to watch her on video offered much comic relief through the frustration and exhaustion." The next day, Penny was brought to the shelter to reunite with her daughter — and the moment they saw each other again had pretty much everyone in tears. "I was bawling," D'Annunzio said. "They were kissing each other’s faces." "The depression literally ended once they saw each other," D'Annunzio added. "We have decided that Penny and Sarah will now stay together," the shelter announced on Facebook when posting the video of their reunion, "and when they do find their forever home, it will be as a pair." Sarah's sibling is still at large — and Asher is working on locating and catching him now. The shelter will welcome him with open arms once she does. As for Penny and Sarah, the shelter is letting the mother and daughter just be together and decompress after such a tumultuous time. They're already spayed and house-trained — but they need a little time to feel emotionally ready for a new home. "We’re giving them time to get back to normal and settle. We’re going to judge when they’re ready for a new home day by day." D'Annunzio said. "We love having them around anyway." You can inquire about adopting Penny and Sarah together when they're ready for a new home by filling out an application. Thinking about adopting another pet? Then meet Dodo Adoptbot, an interactive guide for new pet parents. Get started on Facebook Messenger or text HOME to 38349.